Location: Straiton, South Ayrshire, Scotland. 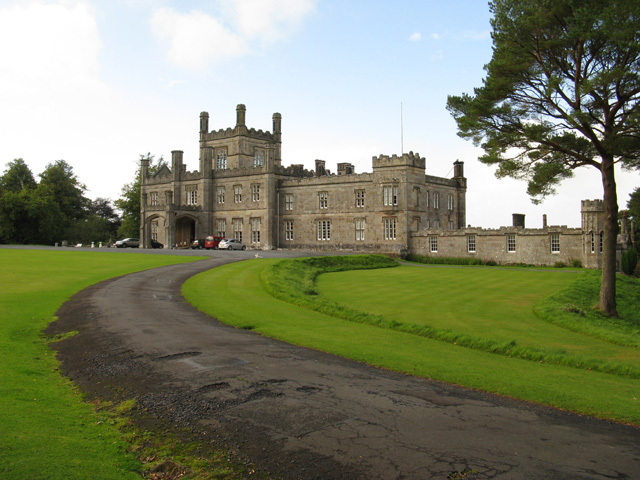 Notes: Blairquhan is a Regency era castle near Maybole in South Ayrshire, Scotland. It was the historic home of the Hunter-Blair Baronets and remained in the family's possession until 2012, when it was sold to a Chinese company. Blairquhan is protected as a category A listed building, and the grounds are included in the Inventory of Gardens and Designed Landscapes in Scotland, the national listing of significant gardens. Four different families have lived at Blairquhan or on its lands. The McWhirters built the first tower house about 1346. The Kennedys then inherited the estate through marriage and built the remainder of the old castle about 1573. In the early 17th century the Whitefords took over, but in 1798, suffering the effects of a bank crash, they sold Blairquhan to Sir David Hunter Blair, 3rd Baronet, the second son of Sir James Hunter Blair, 1st Baronet who had married Jean Blair, the daughter and heiress of John Blair of Dunskey in Wigtownshire in 1770. When Jean Blair inherited her father's estate in 1777, the family took the additional surname of Blair. In 1820, Sir David commissioned Scottish architect William Burn to design a new house on Blairquhan. The old castle, which had become ruinous due to previous fires and neglect, was torn down for a new the Tudor-style castle, which nevertheless incorporated some of the decorative mouldings and sculpted stones from the old castle into the kitchen courtyard of the new house. The new mansion was completed in 1824, and contains many antiques and an important collection of paintings by Scottish artists.